Fill in your details & once ticked t&c’s box, the submit button will appear. The promoter is: ARTA Awards Limited of 218A Brick Lane, London E1 6SA (!!!8220;Promoter!!!8221. The person taking part in the Prize Draw (!!!8220;Entrant!!!8221. 3.1 The person chosen from a random draw of entries for the Grand Finale (!!!8220;Contestant!!!8221. 4.1 The date of when the draws will take place (!! !8220;Cook off Selection event!!!8221. 5.1 The date of winner announcement (!! !8220;Grand Finale!!!8221. 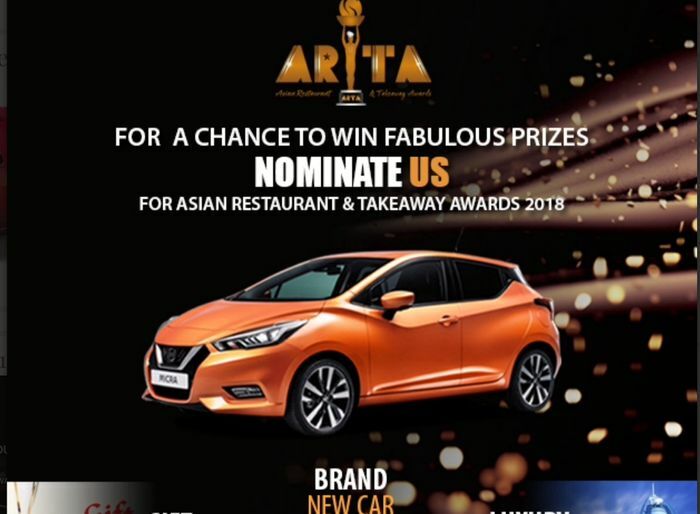 6.1 Win a Brand New Car by nominating your favourite Restaurant and Takeaways (!! !8220;Prize Draw!!!8221. 7.1 Brand New Car (!!!8220;Prize!!!8221. 7.2 Shopping voucher worth £100.00 x16 (!! !8220;Runner up prize!!!8221. (a) To submit entries online go to artauk.com. Create an account by registering your details. Complete the online nomination entry form and submit no later than the closing date and time. An automated email will be generated. Entrants must verify their email address by clicking the link emailed to them to confirm entry into the prize draw. (b) To submit entries by hand, go to artauk.com and download the nomination entry form. Entries must be handed to the Restaurant and Takeaways nominated no later than the closing date and time. 8.2 Prize draw(s) will run from 13:00 on January 2018 to 23:59 on 17th June 2018. (the !! !8220;Closing Date!!!8221inclusive. 8.3 All prize draw entries must be received by the Promoter at the address set out at condition 1 by no later than the Closing Date and time. All Prize Draw entries received after the Closing Date and time are automatically disqualified. 8.4 Sixteen draws will take place, one from every region. The draws will take place on (Date tbc in June 2018 live on Social Media - VENUE TBC) (!! !8220;Cook off Selection event!!!8221. 8.5 The sixteen contestants will be selected for the Grand Finale which will be held at The InterContinental London - The O2 (!! !8220;Grand Finale!!!8221. 8.6 No purchase necessary and there is no charge to register for use of the website. 8.8 By submitting prize draw entry, you are agreeing to be bound by these terms and conditions. 8.9 For help with entries, please contact the consumer helpline on info@artauk.com OR visit artauk.com. 8.10 Please see artauk.com for a copy of the Prize Draw(s) terms and conditions. 8.11 Sixteen contestants will be chosen from a random draw of entries in accordance with these Terms and Conditions. The draw(s) will be performed by a random computer process. The draw(s) will take place on (Date TBC in June 2018 live on Social Media VENUE TBC) (!! !8220;Cook off Nomination event!!!8221. The outcome of the draw(s) will be final. 8.12 Name of the Contestants selected for the Grand Finale can be viewed on artauk.com and all ARTA Social Media from the Closing Date to the date of the Grand Finale. 8.13 Name of winner will can be viewed on artauk.com and all other ARTA Social Media throughout the year from the date of Grand Finale. 9.2 In entering the Prize Draw(s), you confirm that you are eligible to do so and eligible to claim the prize you may win. The Promoter may require you to provide proof that you are eligible to enter the Prize Draw. 9.4 Entrants are not allowed to nominate the same nominee in the Prize Draw again. Entries on behalf of another person will not be accepted and joint submissions are not allowed. 9.5 The Promoter reserves all rights to disqualify you if your conduct is contrary to the spirit or intention of the Prize Draw. 9.6 Prize Draw entries cannot be returned. 10.1 The winning prize is Brand New Car. 10.3 The winner must make their own arrangements to legally collect the car from the provider. 10.4 The prize does not include petrol, insurance, warranties, tax or other associated costs. Any other costs incurred in addition to those set out above and that are incidental to the fulfilment of the prize are the responsibility of the winner. 10.5 The winner is responsible for taxing, insuring and all other liabilities and responsibilities arising from the owning the prize. 10.6 It is the responsibility of the winner to ensure that they have valid documentation which includes, without limitation, a valid insurance cover note to register the car and a current driver's licence. 10.7 The prize is supplied by [NAME AND ADDRESS OF THIRD PARTY TBC] (the "Supplier"). The Promoter reserves the right to replace the prize with an alternative prize of equal or higher value if circumstances beyond the Promoter's control makes it necessary to do so. 10.8 Prize is subject to availability. The Promoter reserves the right to substitute the prize with a prize of equal or greater value. 10.9 Third party terms and conditions apply to parts of the prizes where applicable. 10.10 The prize is not negotiable or transferable. 11.1 The runner up prize(s) is a shopping voucher worth £100.00. 11.3 The prize is supplied by [NAME AND ADDRESS OF THIRD PARTY TBC] (the "Supplier"). The Promoter reserves the right to replace the prize with an alternative prize of equal or higher value if circumstances beyond the Promoter's control makes it necessary to do so. 11.4 Prize is subject to availability. The Promoter reserves the right to substitute the prize with a prize of equal or greater value. 11.5 Third party terms and conditions apply to parts of the prizes where applicable. 11.6 The prize is not negotiable or transferable. 12.1 The winner of the Prize Draw will be announced in a live event held at InterContinental Hotel London - The o2 on 30th September 2018. (!! !8220;Grand Finale!!!8221. 12.2 The results of the prize draw is final and no correspondence or discussion will be entered into. 12.3 The Promoter will announce the winner in a live event held at InterContinental Hotel London - The o2] on [30th September 2018 (!! !8220;Grand Finale!!!8221. 12.4 The winner(s) can be viewed on artauk.com throughout the year from the Grand Finale date. 13.1 The winner will be announced live. The winner of the prize, will have 28 days from the date of the Grand Finale to claim the prize. If you do not claim the prize by this period your claim will become invalid. 13.2 The winner must be present to collect the prize. The prize may not be claimed by a third party on your behalf. If the winner does not have a valid driving licence, a third party can drive the car away, provided they are with the winner, they are insured to drive the car and hold a valid driving licence. It is the responsibility of the winner to ensure that they have valid documentation which includes, without limitation, a valid insurance cover note to register the car and a current driver's licence. 13.3 The Promoter will make all reasonable efforts to contact the winner. If the winner cannot be contacted or is not present at the Grand Finale, or has not claimed their prize within 28 of days of the Grand Finale Date, the Promoter reserves the right to forfeit the prize. 13.4 The Promoter does not accept any responsibility if you are not able to take up the prize. 14.1 The runners up will be announced live. The runners up of the finale will have 28 days from the date of Grand Finale to claim their prize. If they do not claim the prize by this period your claim will become invalid. 15.1 The Promoter will make all reasonable efforts to contact the runners up. If the runners up cannot be contacted or is not present at the Grand Finale, or has not claimed their prize within 28 of days of the Grand Finale Date, the Promoter reserves the right to forfeit the prize. 15.2 The Promoter does not accept any responsibility if you are not able to take up the prize. 16.1 The Promoter disclaims liability for any injury or damage to your or any other person!! !8217;s computer relating to or resulting from participation in or downloading any materials in connection with the Prize Draw(s). 16.2 The Promotor will not be responsible or liable for any data charges incurred by the network providers for using the website. 16.3 The Promotor reserves the right at any time and from time to time to modify or discontinue, temporarily or permanently, the Prize Draw(s) with or without prior notice due to reasons outside its control (including, without limitation, in the case of anticipated, suspected or actual fraud). The decision of the Promotor in all matters under its control is final and binding and no correspondence will be entered into. 16.4 The Promoter reserves the right to amend these terms and conditions at any time. 17.1 All Prize Draw entries and any accompanying material submitted to the Promoter will become the property of the Promoter on receipt and will not be returned. 17.3 You agree that the Promoter may, but is not required to, make your entry available on its website artauk.com and any other media, whether now known or invented in the future, and in connection with any publicity of the Prize Draw(s). You agree to grant the Promoter a non-exclusive, worldwide, irrevocable licence, for the full period of any intellectual property rights in the Prize Draw entry and any accompanying. 17.4 You agree to receive newsletters and other promotional offers from the Promoter by post or email. 18.1 If you are the winner of the Prize Draw(s), you agree that the Promoter may use your name, image and town or county of residence to announce the winner of this Prize Draw and for any other reasonable and related promotional purposes. 18.2 You further agree to participate in any reasonable publicity required by the Promoter. 18.3 By entering the Prize Draw, you agree that any personal information provided by you with the Prize Draw entry may be held and used only by the Promoter or its agents and suppliers to administer the Prize Draw(s) and upcoming promotions. 19.1 If there is any reason to believe that there has been a breach of these terms and conditions, the Promoter may, at its sole discretion, reserve the right to exclude you from participating in the Prize Draw. 19.2 The Promoter reserves the right to hold void, suspend, cancel, or amend the prize Prize Draw where it becomes necessary to do so. Thanks, hopefully one of us will win this. Good Luck ngai! What name does redevers use on here? ngai not seen any sign of him on here yet. I did notice that ngai, just not seen any comments etc from him recently. Tried typing that in & no results. Must be doing something wrong. Thanks, thought better include, as Motorhome comp had none. Good Luck telmealing. Hi, good to know you’re still around redvers. Good Luck!